Satomi Samantha Yamamoto with her husband, Hideo, and her son, Rei. 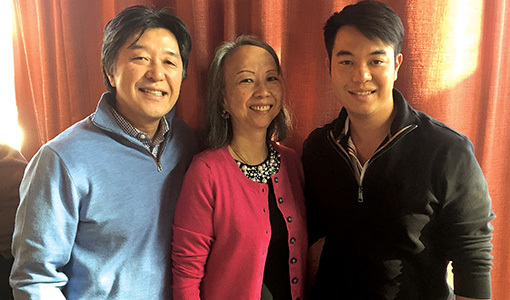 Satomi Samantha Yamamoto, DG90, DI93, was a teacher and mentor who inspired Tufts dental students for almost three decades, a comforting clinician and master dentist, and a beloved wife and mother. Yamamoto, an assistant clinical professor in periodontology, died June 12, at age sixty-three. Yamamoto was born in Tokyo, and received her first dental degree from Tokyo Dental College in 1979. She began teaching at Tufts in 1990 and was promoted to assistant clinical professor in 1994. “Being an accomplished periodontist, Samantha enjoyed teaching the predoctoral students equally with the postdoctoral students, upholding the Irving Glickman tradition at Tufts to provide periodontal education to all students,” Levi said, referring to the legendary professor who established the foundation for Tufts’ periodontology program. Former students recalled Yamamoto being the spark who led them to pursue the specialty, and as a kind, guiding hand for them as they made their way through a strenuous program. She and her husband of thirty-seven years, Hideo, lived in Brookline, Massachusetts. Levi recounted how for many years, he and his wife would meet the Yamamotos for breakfast once a month at Zaftig’s restaurant in Coolidge Corner. “This was always the highlight of our weekend and provided us an opportunity to share stories of our lives at work and at our homes, discuss our children, and the latest happenings at Tufts or in our offices,” Levi said. Those breakfasts also led to a fruitful partnership for Levi and Yamamoto teaching continuing education courses in Thailand. “We all carry a bit of her with us every day and in everything that we do, because she gave, and she gave, and she gave,” Levi said. In addition to her husband, Yamamoto is survived by her son, Rei; her sister, Shinobu Furuyama, and a nephew. Donations in her memory may be made to the American Cancer Society, https://donate3.cancer.org.